ایت بال – نوع دیگر – game rules. 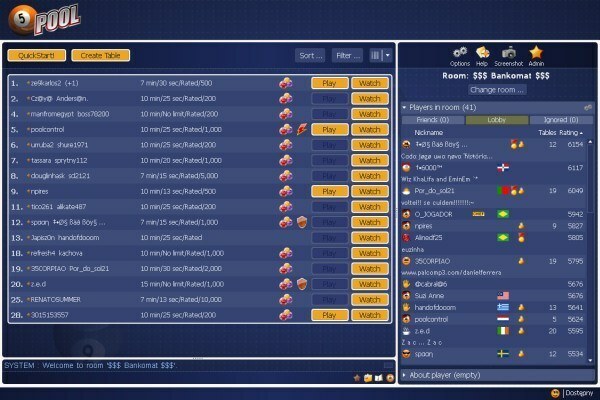 روش بازی – see how to play ایت بال – نوع دیگر on GameDesire! پیروزی خود را اعلام کنید قبل از این که رقیبان دیگر این کار را انجام بدهند! 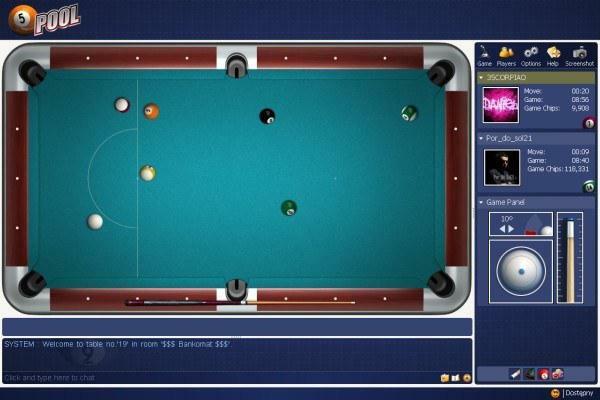 Pool 8 is a game for two players played on a table with seven solid colored balls (solids), seven striped balls(striped), and one black ball (the 8-ball). The object of this game is to use a cue stick and a white cue ball to hit your set of balls (either striped or solid) into the table pockets. 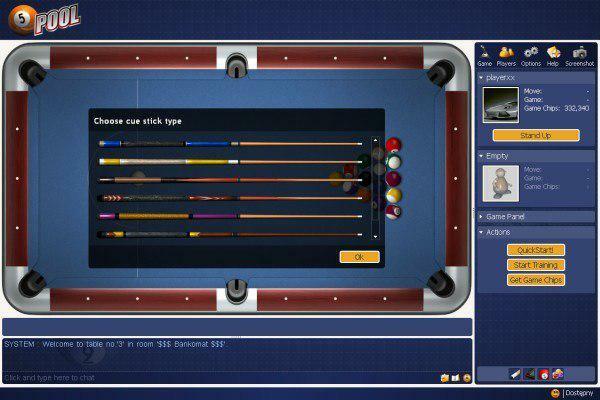 Players use their cue stick to hit the white cue ball. The white cue ball should then contact a colored or striped ball and propel the ball into one of the table's six pockets. The first player to shoot all of his set of balls (either striped or solid) into the pockets must then shoot the black 8-ball into a nominated pocket to win the game. If during a player's turn, he pockets one of his balls without committing a foul, he continues playing (see below for a list of fouls). If the player fails to pocket one of his balls, pockets one of his opponent's balls by accident, or commits a foul, it then becomes the opposing player's turn. If at any time, a player accidentally pockets the white cue ball, (even if he pocketed one of his own balls during the shot) it becomes the other player's turn. Any player that intentionally or unintentionally pockets the black 8-ball BEFORE pocketing his set of balls automatically loses the game. The game starts with all balls (except for the white cue ball) placed in a triangle formation at one end of the table. The player that is going to "break" the balls, places the white cue ball anywhere in the lower quarter of the table that is furthest from the balls. 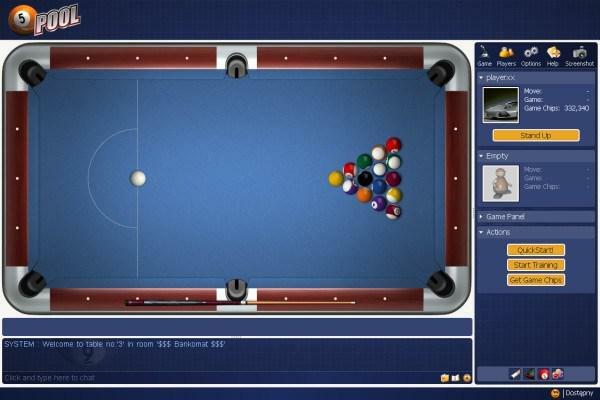 The player then "breaks" the triangular formation of balls using the white cue ball. If during the break, the player pockets a ball, he can continue to pocket that ball set for the rest of the game OR he can begin to pocket the other ball set. If he sinks both a striped and a solid during the break, he can choose which set of balls he wishes to pocket during the game. In other words, it doesn't matter how many or what color (striped or solid) balls the player pockets during the break. The first ball that a player pockets AFTER the break determines what color set he will pocket for the rest of the game. After a player has pocketed all balls of his set, he must then pocket the black ball. Before shooting for the black ball, the game will ask the player to first nominate which pocket he intends to shoot the black ball into. After the player nominates a pocket, he must then shoot the ball into that pocket. If the player pockets the black ball into the pocket that he nominated, he wins and the game is over. If the player pockets the black ball into a pocket other than the nominated pocket, he loses and the game is over. If the player does not pocket the black ball, it becomes the opposing player's turn. Foul are essentially illegal moves or actions that lead to penalties against the player committing the fault. The opposing player can allow the game to continue as normal, as if no fault occurred. If this option is chosen, it will be the opposing player's turn to shoot. The	opposing player can allow the player that committed the fault to re-rack the balls and then re-break them. The	opposing player can re-rack the balls himself and then re-break them himself. If the player that is breaking the balls pockets the white cue ball during the break, regardless of how many other balls may have been pocketed, it is a foul. It becomes the opposing player's turn. The opposing player may now place the white ball anywhere behind the baulk line. The baulk line is the line that separates the lower quarter of the table from the rest of the table. After placing the white cue ball BELOW the baulk line, the player must shoot for a ball that is ABOVE the baulk line. If, at any time, a player pockets the white cue ball, he loses his turn. The white cue ball is removed from the pocket and given to the opposing player. The opposing player can now put the white cue ball ANYWHERE on the table before he shoots. The opposing player can shoot for any of his balls. If a player pockets one of the opposing player's balls, it is a foul. The player loses his turn and the opposing player is given the right to shoot. If a player pockets the black ball before he has pocketed all the balls of his set (solids or striped), he instantly loses and the game ends. If a player hits the white cue ball and the white cue ball does not subsequently come in contact with any other ball on the table, a foul has been committed. It is now the opposing player's turn. The opposing player can now put the white cue ball ANYWHERE on the table before he shoots. The opposing player can shoot for any of his balls. If a player shoots and the white cue ball FIRST comes into contact with one of the opposing player's balls, a foul is committed, even if the player sunk one of his own balls during the shot. It is now the opposing player's turn. The opposing player can now put the white cue ball ANYWHERE on the table and shoot for any of his balls. Note: This foul does NOT apply immediately after the break, before players have been assigned their ball set (striped or solid). If a player shoots and the white cue ball FIRST comes into contact with the black ball, a foul is committed unless the black ball is the shooter's last remaining ball on the table. It is now the opposing player's turn. The opposing player can now put the white cue ball ANYWHERE on the table and shoot for any of his balls. For	every shot, a player must cause the white cue ball to directly or indirectly contact at least one ball of his set, otherwise a foul has been committed. For every shot, the ball that has been first hit by the white cue ball must then either go into a pocket, contact a cushion, OR cause another ball (including the white cue ball) to directly or indirectly contact a cushion or go into a pocket. (The cushion is the side of the pool table.) If one of these things does not occur, a foul has been committed. It will then be the opposing player's turn. The opposing player can now put the white cue ball ANYWHERE on the table before he shoots. The opposing player can shoot for any of his balls. If,	after pocketing all of his set of balls, the player pockets the black ball into a pocket other than the pocket he has nominated, he loses and the game is over. If a player pockets the last ball of his set and the black ball at the same time, it is a foul and that player automatically loses the game.